Size: 42" circumference at top Height: 15"
Show your Spirit! 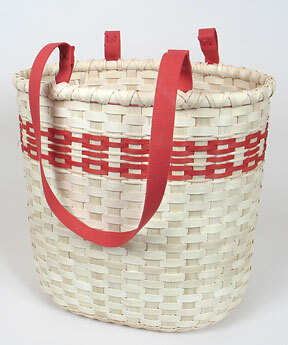 Carry this tall, striking basket to your favorite sports team's tailgating events, to the pool, to crafting classes or anywhere you are hauling a load. The wooden base adds to the durability and the Shaker Tape Handles are flexible and strong. Made of natural and dyed reed material. Personalize with colors of your favorite team or any colors you desire. Special thanks to Lynne Marrs Hammer Ferguson, Artist In Residence, Kentucky Library and Museum / Western Kentucky University, for her inspiration in developing this pattern. Calculate Supplies for 1 to 20 Show Your Spirit baskets with the Basket Supply Calculator. The Supply List gives you the least expensive way to purchase the supplies for your quantity of baskets. View on-line or print to your printer.